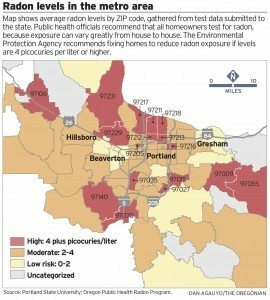 You may have heard about radon recently- I’ve read about it on oregonlive and heard about it on the radio. Radon is an odorless, colorless radioactive gas that is known to cause lung cancer. New construction in Portland requires radon venting from the soil to the exterior of the home, but older existing homes don’t usually have this venting. Where is your home located? Are you at risk? If one in four homes in the Portland area are at risk for radon- don’t you want to know if you are one of them? It may be time to get your home tested- it’s well worth the cost! Cascade Radon has some great links as well as info about a $10 test kit and a free radon forum on Thursday, January 24th (tonight!) at Portland Water Bureau’s Water House (1616 NE 140th Ave.).